Agnes V. Waite was born on July 27, 1891 in Banning, California as part of the Serrano tribe. Her parents were Joseph Waite and Louisa Maria Antonio Desbelladoes. Mr Waite was a white American born in Taos, New Mexico, while her mother was a Native Indian born in California as part of the Serrano tribe. According to the records, Agnes was raced as a Native Indian even though her father was a white American. Agnes live in San Bernardino, California, according to the 1900 United States Federal Census with just her father, as her mother passed away in 1896. Agnes had one brother and three sisters. Agnes’ student file reveals most of the information that can be gathered about her life. She attended three different schools from first grade until graduating. She began her schooling in the Day School in Morongo Valley, California were she only attended for first grade. She then went on to Perris School in Parrie, California from 1898-1901. Here she attended second and third grade. The following year in 1902, she attended Sherman Institution in Riverside, California until 1906 were she did fourth until ninth grade. Lastly, she attended the Carlisle Indian School, a “Nonreservation School” as stated on the enrollment form, were she finished her education. Agnes began at the school in 1908, which entails that she took two years off between Sherman Institution and Carlisle Indian School. Here she stayed for three years until her graduation in 1912. Through all of her years at the Carlisle Indian School, Agnes posed of goof health care, as her physical record file states. During her time at the school, she obtained three reports. Overall, she was an excellent student, with good conduct, health, ability, cleanliness, and condition of room and clothing. However, during her second year, she got a “medium” for conduct and ability, hinting that there was a change in her person during her second year. Nonetheless, Agnes’ report for her third year she excellent at conduct and ability again. 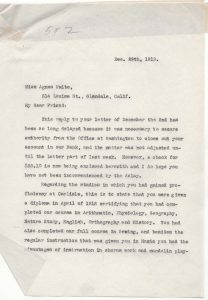 A letter sent to Agnes states: “you were given a diploma in April of 1912 certifying that you had completed out course in Arithmetic, Physiology, Geography, Nature Study, English, Orthography and History. You had also completed out full course in Sewing” which notes all of her accomplishments at the school (Student File). After leaving the Carlisle Indian School, she was a teacher at the Ft Yuma Indian School in Arizona in 1915. According to the 1920 United States Federal Census, Agnes married Bion E Mills, and changed her last name to Mills somewhere between 1912 and 1920. Together with Bion Mills, they had two daughters, Alice Mills (1917) and Dorothy Mills (1921), and one son, Bion E Jr Mills (1927). No other information can be gathered about her life. At the age of 94, on April 1, 1986, Agnes died in Banning, California (Ancestry Library). 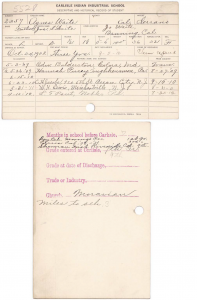 This entry was posted in Agnes V. Waite, Tribal Educators and tagged Ancestry Library, Bibliography of Native American Writers, Indian Boarding School, U.S. Census. Bookmark the permalink.